We bank online. We buy things on our computers. Everything from our wills to our accounting software is on our home computers. But one drive around a neighborhood with my phone looking for hotspots, and I can see dozens of homes ready for a hacker to steal their information. We live in a high-tech world. Too bad more people don’t educate themselves about how to keep their home computers safe. We put in alarm systems. Do we purchase firewalls? Do we password protect our wifi and home computers? Do parents and kids share the same login ids? These are just a few of the 22. Here’s a quick video with the 22 most common mistakes I’ve seen since beginning my work with computers in 1993. This is a beginning video that I also share with my students and their parents. What did I miss? I’ve already updated the video once. Is there anything else that needs to go in there? I know this is a very simple explanation, but my audience is beginners. I’d appreciate feedback before I share this with my students next week. 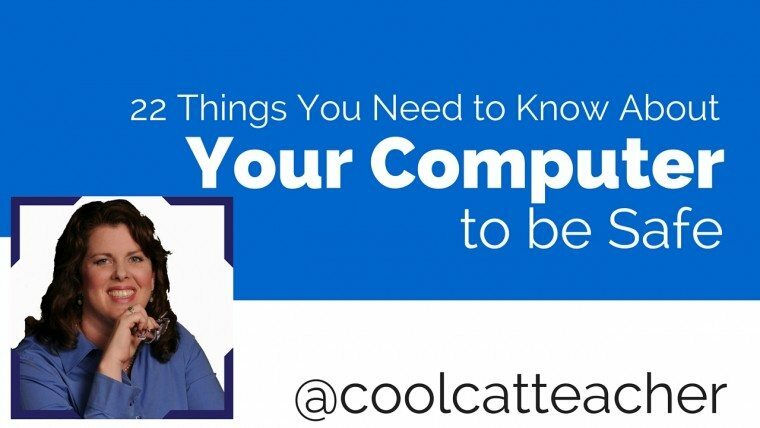 The post If You Don’t Know these 22 Things About Computer Security, You’re Headed for Trouble appeared first on Cool Cat Teacher Blog.